A fork you’ll use every day—for everything. Our large silicone fork easily handles all kinds of kitchen tasks—from mixing and mashing to stirring and scrambling. Use it to lift poultry, flip burgers, separate pulled pork and much more. Made of durable, food-safe silicone, this does-it-all fork is heat resistant and dishwasher safe for easy cleanup. Designed and engineered in Germany, these tools were created with full attention to details. Metal cores are engineered to support the silicone and ensure tools are strong and durable for long-lasting use. The silicone is heat-resistant up to 446° and won't scratch your nonstick pans or glass. All silicone tools are dishwasher safe. This will become your most used tool since it is good for all the cooking steps you take during food preparation. Whoever would have thought that a fork could do the jobs of a spoon and easier. I prefer cooking the ground beef with it as I stir and break it up. Gave one to my daughter--she loves it and said it makes amazing scrambled eggs. You will find your own preferences and be happy that you purchased it. Love these - I got 2 due to other reviews. I use them a lot! Great in my Staub pans. These are sturdy! You can mix things up and then keep using in the pan! Fewer items to wash! Really like the versatility of this piece. It scrambles, mixes, and turns very nicely. Would recommend. Love it. I use as a whisk, server, etc,etc. Unlimited usages. Easy care, just toss in the dishwasher. Tough and reliable tool I ‘be ever had. One tool do it all the way. It does everything just as advertised. Really nice. Does a good job with scrambled eggs! Love this tool! Whips up eggs, flips them too! Love the feel of it in my hand as I mix pancake batter, very comfortable. Sent one to my daughter, we're having fun finding so many ways to use it! I have 2 of the forks plus 2 each of 2 different shaped spoons. I love them! Best utensils ever! I am so pleased with this purchase I use this fork more than my other kitchen tools. This ultimate fork is an amazing cooking tool I will purchase again in the future thanks. When you invest a great deal of money on pots, pans, and skillets you need great utensils that will not mar them. This fork does a wonderful job of protecting them. Whether you are piercing or using as a spatula to lift it performs well. Mashes things nicely. I use it to stir thicker sauces as well. Wish I had purchased long time ago!!! Great product!! I had a few bucks leftover from a gift card and decided to add this to my order, based on reviews. Turns out, I love this little gadget. It's great for stirring, sautéing and any time i'm in need of a spatula/spoon. The sides are useful for scraping a pan or bowl. I use it to turn over vegetables I'm roasting. All around great little tool. Wish I'd ordered more. These forks have a metal core that seem sturdy but also somewhat flexible. I am finding lots of uses for it. I like the range of colors as well. I should add that Ihave tons of kitchen gadgets and routinely eject those that do not seem worth drawer space. This one was advanced to the counter crock and is used routinely. Bought as gift. Son-in-law said it is his favorite utensil. I really like the fork. It's great for removing waffles from the iron, scrambling eggs and many other tasks. I bought it to replace one that I had that the tip broke off a time. I hadn't had it long. The metal doesn't go all the way to the end of the tines, so the ends are fairly flexible so it broke off mashing avocado. Sur la table wouldn't replace it, but I liked it so I was willing to give it another chance. That is the reason for 4 stars. Love this fork it's my second one. This is an awesome kitchen tool! This fork is so versatile! Everyone I gave it to as a stocking stuffer loves it! I gave the Ultimate Fork to a number of family members as a Christmas gift and everyone loved it. It's very sturdy and a perfect size for many cooking tasks. It's heat-resistant for use in stove-top cooking, while its size makes it helpful for food prep tasks. You'll reach for it often. My husband and I were at Sur La Table and we were using a gift certificate. We had a bit left on the gift card so the person helping us showed my husband the ultimate fork. I wasn’t sure of it at all until we used it at home. It is wonderful. We got 3 more and then added ultimate spoons. I found a food flipper that seems made the same but it’s not called “ultimate “ but it also is wonderful. All of these are sturdy, don’t scratch pans and don’t get hot. It’s what we gave our adult kids for Christmas. Received this fork as a Christmas gift from my husband (Richard) and it is the best kitchen utensil I've had ...works not only to "stab", but worked as a scraper and stirrer when making a sauce for the lamb. It is sturdy and comfortable. I would definitely recommend this!. Finally! I found big forks for use in pans and skillets. I had one that broke recently which I had had for about 40 years. Loved it! I got three new forks and love them! Wonderful kitchen tool. Multipurpose. And it’s red. My kitchen is red. I cant believe that it’s taken so long ! This is the most amazing tool ever. Works with hot or cold food. Mashes, Mixes and blends. Won’t melt in a hot pot or burn your hands. Love this fork for making scrsmbled eggs in my non-stick skillets!! Great quality and feels good in your hand. Well done SLT!! I use this fork as a spoon, a spatula and a mixer. It is a great kitchen tool that I use almost daily. I use this almost every day. From scrambling eggs to stiring pasta to many other things cooking in a pot. The most used utensil in my arsenal! Love it! Been looking for an item like This for many years, ever since my 25 year old plastic fork bit the dust. I love using this in my non stick pans and the handle length is perfect. Received one as a gift last year and loved it so much got some for the kids for Christmas. Great for waffles and scrambled eggs. Easy cleanup. I bought this fork for myself and, after using it once, bought several more to give as gifts! It is so versatile and comfortable to use for a multitude of cooking tasks. Great idea right here in this fork! I’ve been wanting one for a while! Love it! Got one for my daughter and a friend! Great idea! I haven't found lots of uses so far. The quality is fine. I need to find more uses for this item. Not sure how I managed without this fork! Sturdy, yet doesn’t scratch pans, etc. I bought this tool an a whim and had no idea how helpful it would be! Sure you can shred meat with it, but it seems to come in handy for so many other tasks. I keep it in my tool jar by the stove because it is used almost daily. I love this fork. Gave it to all my women friends for Christmas. You can actually stir eggs in your pan with it! use in cooking and prep. Why didn't someone think of this before! Bought this on a whim then went back and bought 5 more as little hostess type gifts to have on hand. Use it with doughs that need very light handling, like scones; light and fluffy scrambled eggs; an extra hand when flipping tender foods like fish. This simple design creates the perfect tool for so many uses. Strong and durable, yet soft and perfect for Calphalon cookware. Easy to clean, great! I love this Silicone Fork. It works as advertised. I only wish the handle was a bit longer. The Fork is great for Scrambling Eggs, Mashing Potatoes and stirring Pasta in boiling water. Great fork. Very comfortable to use. I love the curve of the mixing part- so useful for so many tasks. The colors are snappy. I bought these to cook noodles because my ancient plastic fork for the job finally all broke. The handle is just a tiny bit short but does the job. But the biggest problem is you can't cut a noodle with these to see if the noodle is done. I had read the reviews and never noticed this particular issue come up so had no idea. When you get them the side of the fork prongs are like nearly a half inch thick. So absolutely no way to cut a noodle like I am used to with other types of cooking utensils. I still like it for the stirring of noodles, though a little longer handle would be desirable. As for a masher, I'm certain it would work just fine but I have no use for it in that way. I'm keeping mine but had I loved them I had planned on buying 10 more just so I'd have one the rest of my life, and then buy more for friends and family. Now... well... I'll just keep the 3 I have and still continue m search for something that works like our old style fork thing that is no longer sold. They look intriguing and have good reviews. Buying three to share. I need an efficient tool to mash avocados when making guacamole. This has become my new favorite kitchen tool! I had to get more for gifts cause they are so great, with a variety of uses, including whipping up the fluffiest scrambled eggs. Love it! I liked that it could be used for many different things. Ive been wanting one for a long time! I have been looking for a good cooking fork for years. This looks like it is just what I need. This is the first time I have found a silicone fork. It looks nice and will round out my red silicone kitchen tool set. Have had trouble finding a fork like this to do stir frying or to cooked scrambled egg in a non-stick skillet...they are next impossible to find. I have this tool and have given several as gifts. This a great and sturdy tool, welcome addition in my kitchen. Everyone i have given one to has loved it. I don’t think you can go wrong with this. Based on the rave reviews, I had to get it! I need to use when cooking turkey bacon, etc. in my non-stick skillet/griddle. Have one, this is for my daughter. Want a silicone big fork for cooking. Presently, use metal or wood ones. Saw it in the catalog and it looks quite useful. I bought one at my local Sur La Table a few months ago and it has replaced all spatulas and stirring tools I had. Love them! I hope it is as useful as the reviewers say it is. Bought it primarily for use with my Staub cookware. Looks like it will work well for scrambled eggs and Avacado mashing. Looks very useful and has great reviews. I already have this fork and do like how it handles when cooking--specifically when turning chicken breasts etc. Great to use with my Instant Pot and not scratch it! I already had one of these and liked using it. It sits well in the hand and is very good for scrambling eggs. However, the silicon tip of one the tines broke off after only a few months of normal use, so I nearly didn't order it again. But because I like it I've decided to give it another try. Daughters loved this Christmas gift.... so thought I would buy one for me !!! Years ago I had a similar tool. Found it convenient for stir-fry and sautéing vegetables. I used all the time. It broke a while ago, and I’ve missed it. SO excited to find this! Looked interesting. Wanted to see how many ways this could be used. This utensil will have so many uses from deglazing, sauce-making, assisting in turning and flipping foods, etc. Best of all, it won't damage delicate cookware. It's a great size and has an easy to grip handle. What is under the silicone ? Is there metal inside ? Wood ? Or is it just solid silicone all the way through ? How sturdy is this fork ? BEST ANSWER: It does have a core of some sort. I would guess metal or a very hard plastic. The piece is very sturdy. It wont really pierce anything, though, unless it is something soft like a baked potato, etc. The very tips of the tines (about 1/4") do not have the core material, so they bend a bit. I have used mine to flip grilled cheese, in place of a whisk, and for mashing and stirring. I like it very much and would buy it again. Thanks for the additional info about the tips of the tines. The tag that was attached to my fork says “Soft-surface fork with rigid steel core whisks, mixes, flips and won’t scratch”. Excellent details. Thanks ! This info should have been in the online description !! The silicone fork has a metal base core. 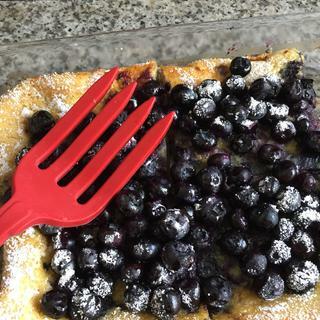 The fork is very sturdy but I did not use or keep the ones I ordered because I had a problem with a silicone coated metal spatula where the silicone wore away and exposed the metal and I did not want to take a chance on that happening to the forks. However, the spatula in question did not come from Sur La Table and was not made by the same manufacturer so it is possible this fork would not have that problem. I had just been hoping for a solid silicone utensil. This is the best fork that I have ever used for cooking. I bought one for my daughter-in-law too and she loves it. The fork is quite sturdy, but not totally inflexible. I think that the core is metal, but I'm not 100% sure. This is a winner in my kitchen! Yes, it has a steel core, very sturdy for stirring, light mashing, etc. Soft silicone surface with rigid steel core. The fork is very sturdy. Can you use this on the grill? BEST ANSWER: Silicone tools generally can be used in temperatures up to 450 degrees - the description of this fork states it is heat resistant up to 446 degrees. Frequently temperatures on a grill go higher than that and may have flare-ups with significantly higher temperatures. I would not use it on a grill at all. Hello! Yes it can! I've used it while grilling and had no issues. I believe the specifications say that it's heat resistant to around 445 degrees so keep an eye on your temps, but I've used it with high heat. No, it is silicone and high heat would damage it. It’s a great fork though and I use it a lot. The info on this item says, "Heat safe to 446°F." So it will depend on how hot your grill is. No, it's not designed to be a grilling tool. Does the white fork stain? I'm not sure about the white fork, but my red fork has not encountered any staining issues. I doubt it (because of the material it's made of), but mine is red, so I'm not certain. I have two forks, red and green, they do not stain at all. Can this fork be used in the microwave?? The core of this fork is metal, with silicone covered the outside to not to scratch the pans. I would not use it in the microwave. It has a core, which could possibly be metal. No, this is not intended to be used in the microwave.